Didn’t like the elevator system. Takes too long and sometimes keys don’t work. Carpet needs updating. Shower system is poor. Water gets all over bathroom. Toiletries are good. Poor layout of room we had. Refrigerator and coffee station should be outside of bathroom. Found that to be inconvenient and unsanitary. Need more food options for room service besides hula grill. The property is very dated. The elevators took forever to come up or down. Everyone that was in them had the same complaint. Need major updates. The rooms were clean, but dated. The tub/shower looked old, furniture, carpets looked old. Original room was a city view which had loud noise at night. I had to pay to be moved away from the city view/noise rooms. Parking is $40. There should be a discount for hotel guest since we are paying $39 for a resort fee which covers the small pool with chairs that are always taken. There should be a umbrella/chair discount for hotel guest. Paid $69 for 2 chairs and a umbrella. Basically paying $39 for internet. For the money you are better off staying next door at Moana Surfrider. Loved that the hotel was right on the beach. The staff were so nice. The only thing we didn't like was that they charged us to park our rental car. We were not told that we would be charged for this. I had an excellent view of the ocean but also was able to see city lights from the balcony. Mariam did an excellent job with our excursions. The staff was all excellent!! We go bsck there for sure!! Always wanted to stay here. We finally did and it felt like such a hassel. Elevator was slow, the abc store staff on first level was extremely rude and in general this place was packed all the time. Two good things about it was the great housekeeper's and the valet staff. Great place, excellent staff very helpful with suggestions on what to do and things see would stay there again !!!! Nice hotel. One of the better ones in the Waikiki area. Nice hotel on the. beach. Decent rooms. This was a great hotel...It was right on the beach but it was very busy. We had stayed in quieter area on the island of Oahu, so when we got here, it was overwhelming. I discovered a frozen coconut mojito on my last day there.....I truly recommend it. The hotel was clean and comfortable. I would definitely go back even with the all the people at the beach. In Waikiki there are not too many hotels on the water and we like to stay on the beach so I would go back there again..
Great check-in, friendly staff, awesome room. will be back for sure! 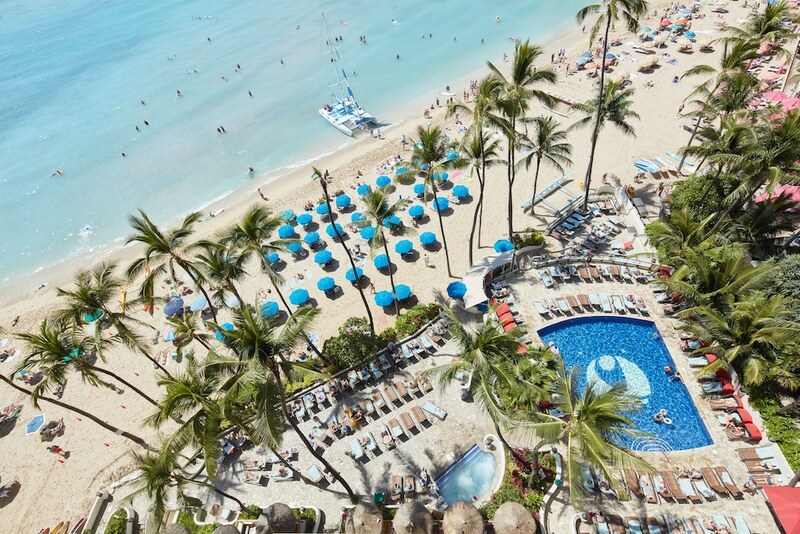 Located in Waikiki, Outrigger Waikiki Beach Resort is next to popular attractions like Waikiki Beach and International Market Place. This 524-room, 4-star resort has 3 restaurants, a full-service spa, and an outdoor pool. This resort is home to 3 onsite restaurants, perfect for a quick bite to eat. Savor a meal from the privacy of your room with room service, or get a pick-me-up at the coffee shop/café. Start each morning with buffet breakfast, available for a fee from 7 AM to 11 AM. Guests can expect to find free WiFi and 27-inch an LCD TV with cable channels and pay movies. The bathroom offers hair dryers and free toiletries. Other standard amenities include a furnished lanai, a refrigerator, and a coffee maker. Guests of Outrigger Waikiki Beach Resort enjoy a full-service spa, an outdoor pool, and a 24-hour fitness center. Valet parking is available for USD 40 per day, and there's also limo/town car service. The 24-hour front desk has multilingual staff ready to assist with concierge services, luggage storage, and dry cleaning/laundry. Other amenities at this beach resort include free WiFi in public areas, conference space, and a 24-hour business center. Thank you for your rating and review. Thank you for the high rating. Mahalo for your 5-star rating and review. We will be sure to let Miriam's supervisors know about your taking the time to mention her in your review. We look forward to welcoming you back. Recreation features at Outrigger Waikiki Beach Resort include an outdoor pool and a 24-hour fitness center.